Preheat oven to 475F, if your oven has a roasting setting use that. Toss the squash in the coconut oil. Arrange on a baking sheet covered with parchment paper cut side down. Sprinkle with salt and pepper. Roast at 475 for 15 minutes or until lightly browned. 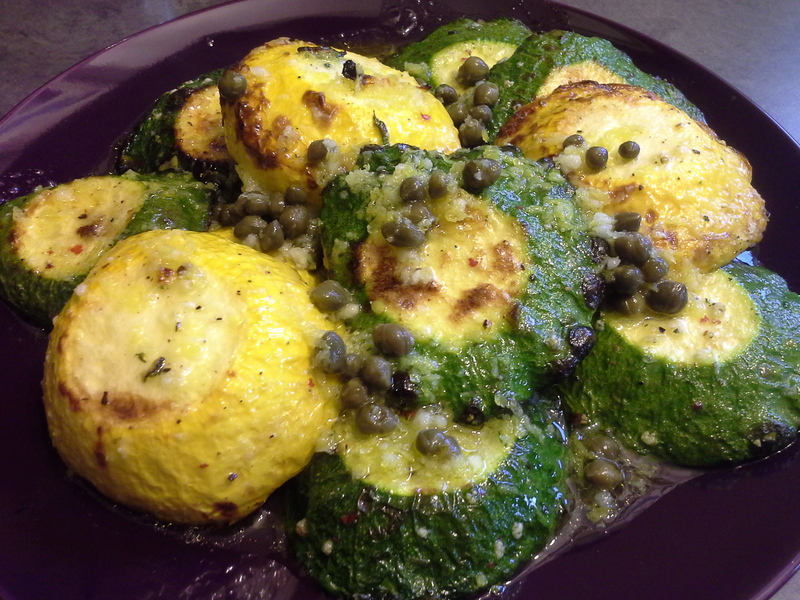 While squash is roasting combine the lemon zest, juice, capers, olive oil and garlic in a ramekin. While mixing mash the capers down just a bit to have them contribute more flavour. Drizzle the dressing over the hot squash and serve immediately. A great side dish with chicken or pork. Serves 4. Per serving, 72 calories, 5.6 grams fat, 5.5 grams carbs, 1.6 grams fibre, 1.6 grams protein. So tasty and so healthy. you might want to have a double portion! Why not? I often do. Now that I have discovered the wonders of the pattypan squash I may just have to give growing them a try next year.